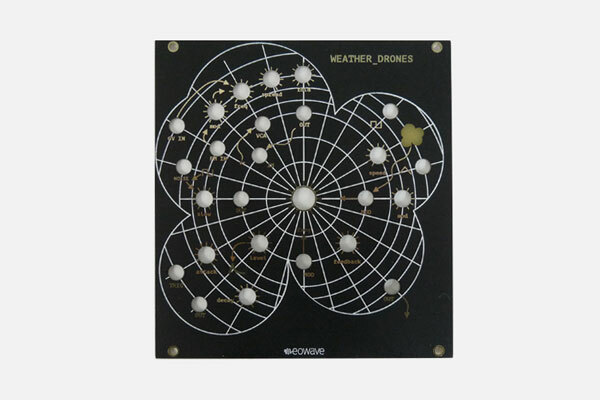 The Weather Drones can be self patched, or used with other eurorack modules via CV and trig inputs. The architecture of the module is as follows, some of which is pre-patched. Digital tri wave oscillator, controls are freq, spread (adds more triangle waveforms, up to 8), character (wave folder), fm in with attenuator, LFO with square and tri wave out Filter with cutoff and feedback, mod input with attenuator and second mod input without AD envelope with level attenuator Random sample and hold noise (driven by square wave LFO) with slew VCA.